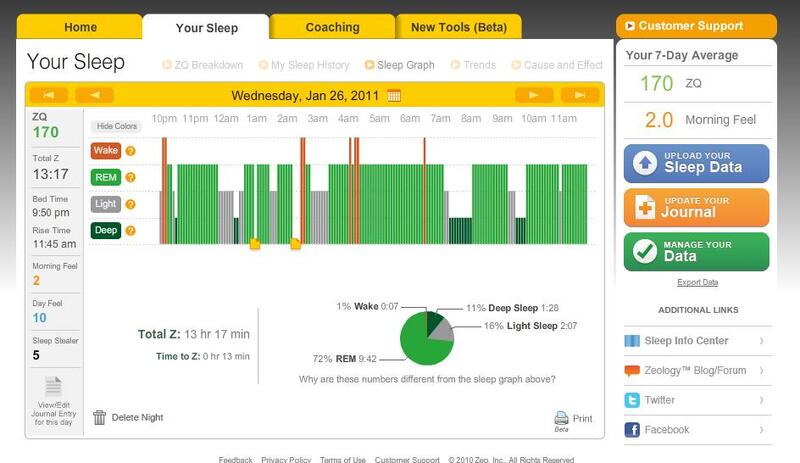 Last night I tried out my gift of the Zeo Sleep Coach for the first time. It didn’t go so well. This thing tracks your brainwaves over the course of the night to show you what’s going on with your sleep. You wear the stylish wireless headband at right, and set an clock-radio-sized device next to your bed. Now, I don’t sleep soundly on a good night. 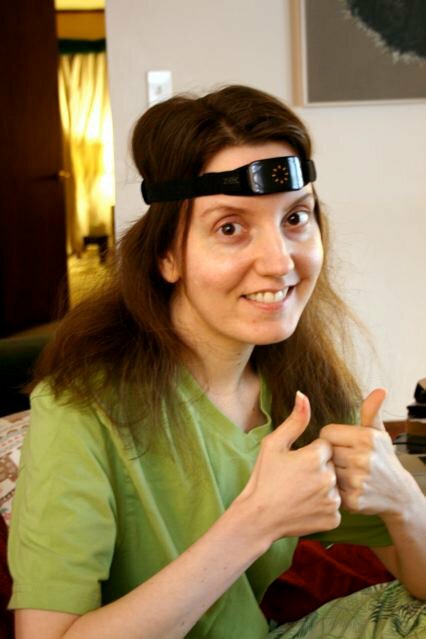 With the headband on (this picture brought comments from my friends on facebook that I looked like a guru, like I was going spelunking, or out to a rave), I got down about when I usually do, but didn’t stay there. I could feel the sensor on the headband working. It was giving me an pulsing sensation every few seconds, which, while not disconcerting, was slightly uncomfortable. I have also felt the beams circling my skull while having an MRI done, so I already know I’m a freakshow when it comes to matters of the brain. I had Chimp put the headband on to see if he could feel it, but he wasn’t able to. Anyhow, that sensation made it mightily difficult to drop off, which is always already a trial. And there were other problems as well. Within ten minutes of putting it on, before I came anywhere close to falling asleep, Zeo was telling me I was in REM sleep. I thought I fell asleep around midnight, which is about normal for me, and it turns out I was pretty close: Zeo said I was in deep sleep at midnight. And it got weirder from there. So here’s the night’s sleep graph. It looks like I was in REM sleep (green) all night, right? Seven hours of REM sleep? And I was awake only briefly (orange)? Nope. I realize some people will say, “Well, you don’t know if you’re asleep; people often think they slept less than they did.” However, I was looking straight at the thing as it declared I was in REM sleep. Here’s how much I actually slept; the red line is where I’m aware I was awake, green where I know I was asleep. So it got that first stretch of sleep right, then told me I was in REM or deep sleep while I was awake, then that I was in a variety of stages of sleep when I actually was asleep. The other thing that’s interesting about this is that I had a sleep study done in 2004, within the first six months I was ill. Here I am on that occasion, stylin’ and profilin’ with stuff glued to me. Interestingly, the night I was in the lab, I had zero REM sleep. It’s been six years since then, and certainly some things could have changed, but I feel doubtful about my results here for that reason. I knew in advance that this device might not work for me, truth be told. I read this terrific and hilarious review at Amazon from a lifetime insomniac, and knowing that it might not work for me, I was still interested in giving it a shot. It sounds, in retrospect, like I am having the same issues he had. So I’m not going to wear it tonight; I have to get some better nights of sleep under my belt before giving it another shot. Chimp is going to give it a go tonight, though, and we’ll see whether his more normal brain (he has only garden-variety insomnia, not the shocking version I do) gets more coherent results. This entry was posted in ME/CFS and tagged freakshow, sleep. Bookmark the permalink. That wouldn’t be the sensor pulsing, it would be the wireless signal, stayin’ alive as it were (802.11 protocols pulse about every second to keep synchronized). The sensor for a brainwave reader is a passive device; an Active MRI tracks bloodflow changes over time to show you which areas of the brain are calling for more fuel (and are thus more active). Very interesting, Zach. Thanks for weighing in. One other device note: I once tried wearing my cell phone in a holster and took it off after less than half an hour – it gave me a burning sensation on my skin below my clothing. Am I just really weird? Yes and no. You’re very sensitive to EM radiation, like several folks I know (one of whom also has trouble with wearing cell phones). I’m moderately sensitive myself, which is why I can hear CRTs (like old TVs and computer monitors) when they’re on and running at around 30-60Hz refresh. Here’s the other thing: Cheney evaluates treatments using a very advanced ecocardiograph, and he has identified deleterious effects from placing a cell phone on a patient’s chest. I think I may return this thing, partially b/c of that. Shame; if it were a wired headband I wouldn’t have that trouble. I’m no doctor, but placing a physical object on someone’s chest will change its resonance, which would affect an echocardiogram. Did he also test with a stone or other object about the same mass and shape, such as by turning the cell phone off? Yes, he has done it with the phone turned on and off, with the effects only with it on. Didn’t think to mention that. I bought a Zeo last year as well and had the same exact problem. It was telling me my sleep was great. It made zero sense! And it was showing me as asleep when I knew for sure I was awake. I even counted every single time I woke up every night I used it, and it showed very few of them. Really! That’s very interesting, Matt. I hoped I’d get something useful out of it, but I just couldn’t sleep with it on. 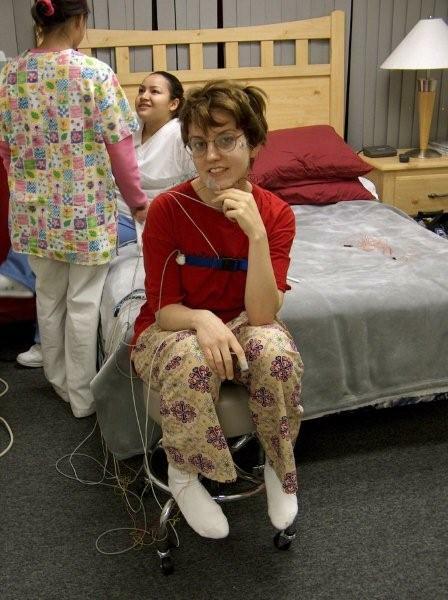 I’ve had an actual sleep study done, and I guess there’s a reason that they hook you up to a million wires.